Understanding where your debt is coming from is the first step on your path to financial freedom. Depending on your age and life experiences, the debt could be a new, recent addition to your lifestyle or something that has been troubling you for years. Regardless of the amount of debt that you have or the amount of time that you’ve had it, getting to the root causes is necessary for you to effectively clear away owed money. So many people will find themselves in the red and won’t have anything to show for it. They will wonder how they managed to sink so financially low or meet credit limits on their cards. But it is important that you know exactly why you are struggling. So, think right back to the first money that you borrowed. This might be a student loan, it could be a bank overdraft, or it could be a credit card. Then work your way back to the present day, noting down everything that can remember borrowing money for and spending lent money on. This will give you a complete summary of every penny that you have spent that was not yours. You will then be able to highlight trends from the beginning of your debt to the present moment. If you have found yourself wondering where all of the money has gone, you will now be able to see. Chances are, you didn’t spend bulk amounts of cash on large purchases. You probably frittered the cash away on smaller, unnecessary items, such as takeaways, drinks, and taxi fares. Small amounts can easily mount up over time and may be the cause of larger amounts of debt. Having highlighted unnecessary spending that has landed you in a sticky monetary situation, you may decide that now is the time that you finally start to budget sensibly. It is easy to ignore your actual income when seemingly endless loans and credit accounts are being offered to you. But it is so important that you live within your means. There’s no better time to start than the present! Turn the page in your notebook and write down your monthly salary. Then list all of your essential outgoings, no matter how small or seemingly irrelevant. This list should include rent, bills, food shopping, gifts for occasions, toiletries… absolutely everything. Deduct the total of the list from your salary. You should be left with a positive number. Preferably with some cash to spare. If you find that your outgoings are amounting to more than your incoming wages, it’s time to tighten up on your spending. Try opting for supermarket own brands foods, less lavish bathroom supplies and do everything within your means to save money on your bills. As long as you are in debt, luxury items are something that you cannot afford to splash out on. No matter how much you have become accustomed to them. Make the necessary cuts to make your lifestyle as cheap as possible. Then use your excess cash to start paying off some of your debts. When you are experiencing money worries, it’s easy to try to ignore the issue. We’re all guilty of refusing to open official looking letters; stuffing them away in drawers out of sight or dumping them straight into the bin. But you can only bury your head in the sand for so long before bailiffs, and debt collectors come knocking at your door. It’s time to face the music. Open your letters, contact your lenders and make arrangements. If you find that you are struggling to make repayments, communicate this. Your lender may be able to reduce the minimum monthly charges, making repayments more affordable for you. 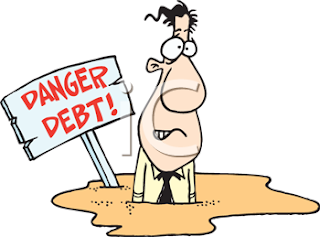 If you ignore letters and miss payments on their due dates, you will only become more and more indebted: you will start to receive penalty fines, face late payments fees and your credit score will begin to suffer as a result of your actions (or general inaction). Some lenders will also remove benefits offered to you when you signed up for your account with them. These may include low-interest rates or interest-free balance transfer periods. If you have debts coming out of your account on different dates throughout the month for different cards, loans, and services, you could truly benefit from consolidating your debts. This essentially means that you take out one larger loan, use the lump sum of cash to clear all of your separate debts, then pay off the one large debt in manageable installments. One all-encompassing debt may seem intimidating, but you are much less likely to miss a payment when you only have one going out a month. This means you will avoid charges and can hold onto benefits such as interest-free rates for longer. If you don’t have much money left over from your wages after paying for your current living costs, you may be able to clear a large amount of debt in one fell swoop. It probably isn’t what you want to hear, but now might be the time to start letting go of belongings that aren’t entirely necessary and hold no sentimental value. This may be a digital camera, some of your old books or limited edition collector's items. People will pay a large one-off sums for desirable items, and this extra cash can make a significant impact on the overall amount that you owe out. If you are experiencing debt, it is always beneficial to have some side project for money making on the go. Instead of heading home and putting the television on or scrolling through your social media feeds for hours, you could try low input business ventures. Try selling some homemade items. These could be cookies and cakes at a local fair or handmade goods online. Any extra cash should be used to chip away slowly at your debts. It may seem silly paying two or three dollars off your card at a time, but these regular, small amounts of money will help significantly. If you find that you are struggling to clear your debts yourself, it may be time to seek professional help. There are so many debt relief options out there that the thought of even finding the right person for the job may feel daunting. But don’t worry, you can and will find the right help. If you have decided that it is time to reach out, read this review first. It provides a complete run through of the pros and cons of one debt relief plan. You can use it as a foundation from which you can learn how to fully analyze whether a certain branch of professional help is the right option for you. When times are hard, endless people will go down the wrong route in an attempt to resolve their problems. But there are certain “resolutions” that tend to turn out for the worse rather than the best. People taking these routes often end up ruining relationships, forming unhealthy habits or even addictions and often end up with more debt than they started out with. These options are to be avoided at all costs. Gambling may seem like a quick fix for all of your problems. You put a little money down and get more back in return. Plus the adrenaline rush that accompanies a big payout will leave you feeling at an all time high. What could be better? Well, not much if that’s how things played out in real life. But sadly, real life is much different to the dream that bookies will try to sell you. There is one stark problem: the odds aren’t always in your favor. You will find that you lose more often than you win and you may start to lose your winnings too. Most of us don’t know when to throw the towel in. Avoid gambling at all costs. Well-meaning family and friends may offer to lend you cash to tide yourself over. But you should avoid incorporating money in personal relationships at all costs. If you are unable to pay people back, tensions will rise, and relationships will suffer. You should also avoid loans that use your friends and family as a guarantor if you are unlikely to be able to make repayments. Your financial mismanagement could have terrible effects on your loved ones’ credit ratings and may even end in their home or possessions becoming repossessed. Payday loans are extremely tempting as a quick fix to your debts. They are easily accessible, and many lenders now offer immediate deposits into your bank. The problem? Paying them back. These loans have excessively high-interest rates, and most people will not realistically be able to keep up with the repayments. You will end up owing a lot of money for a small amount of quick cash.